For over 40 years, BSC has been a vendor and service provider for law enforcement, military, and government agencies. We have also been their trusted partner, and we’re very proud to work with our clients in these fields. Constant change is a given on military bases and in law enforcement agencies, and we strive to provide versatile weapons storage solutions that serve our clients effectively even under changing policies and conditions. We are honored that our products continue to be used by the military, police, FBI, CSI, and other government officers, and we strive to provide them with safe, innovative, and effective weapons and ammunition storage. High-quality weapons storage is an essential component of any military or law enforcement plan for the management, transport, and security of assets including gear, firearms, and ammunition. BSC offers a complete line of high-security weapons storage systems including weapon cabinets, pistol lockers, rifle lockers, and weapon racks, including our innovative and customizable universal weapons racks. We know that space restrictions challenge our clients and that they must maintain high-security premises at all times. Personnel must be ready to mobilize immediately. To serve them well, it is essential that their weapons storage systems make practical use of space, keep firearms under secure conditions, and allow for rapid mobilization. In many of our clients’ premises, space is extremely limited and may even be temporary. Minimizing the footprint of their weapons storage means maximizing available space for other inventory or uses. Our weapons storage racks are designed with a compact footprint and efficient use of their interior space, maximizing the number of firearms and optics that can be stored in a single unit. They offer flexible configurations, allowing our clients to accommodate all of their weapons even as they acquire additional resources. Maximum storage capacity can be achieved by choosing a rack with retractable doors (which allows for narrower aisles between storage systems) or by stacking or fastening racks together. Some shelves can be used in combination with other space-saving systems to minimize their footprint even further. Our high-security products protect firearms and ammunition and ensure they cannot be stolen. Thieves in search of weapons are aware that police stations, military bases, and other law enforcement facilities will have firearms and ammunition on site. It is imperative that storage systems in those locations effectively guard against theft. Regular lockers with combination or keyed locks are simply not sufficient to deter theft. Any experienced thief will have little difficulty bypassing those security measures. Our locking systems exceed military requirements for arms security, keeping weapons in the right hands. Weapons security is of the utmost importance, but if it hampers the ability to access weapons and mobilize quickly, it is a barrier to effective operations. Weapons must be stored securely but remain accessible and ready for quick deployment. Our weapons storage racks were created to maximize visibility, accessibility, and operational readiness. Rapid mobilization can be achieved by choosing storage that does not require disassembly or zeroing weapons. 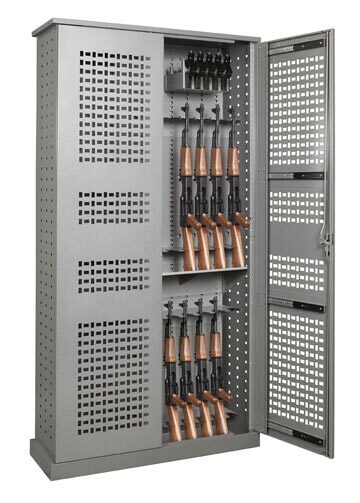 Universal weapons racks offer efficient and versatile open storage and are designed for use in secured facilities. They can store a variety of weapons including rifles, pistols, optics, tactical gear, and other accessories. They are designed to be immediately deployable in many different scenarios, so personnel can be ready to go at any time. Our universal weapons racks feature adjustable brackets with horizontal or vertical storage to accommodate different weapon sizes and types. They allow for quick mobilization because in many cases optics can remain assembled and zeroed during storage. Access doors may be fully retractable for easy access and decreased deployment time. Perforated doors also allow for weapon identification and inventory while firearms remain secured. The racks are easily transportable, allowing them to function both as weapon storage solutions in the police station or military base, and as portable storage during mobilization. They eliminate the need to transfer weapons to a different rack for deployment. Universal weapons racks protect firearms from shock, abrasion, movement, and vibration during transport, and their space efficiency means that there is more room in transport for other items and equipment. Tilting will not cause weapons to detach from the rack. 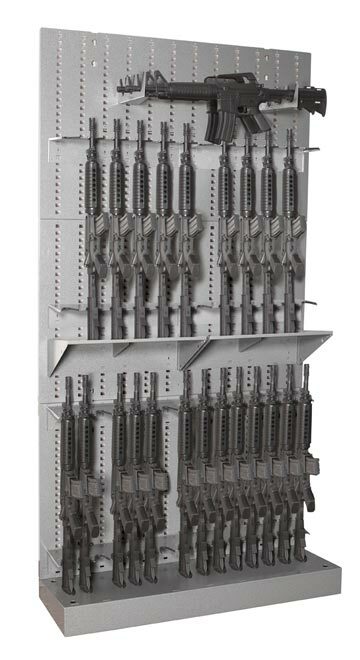 Universal weapons racks are a versatile choice, combining secure and efficient storage with readiness for deployment. BSC can create a custom weapons storage plan that fits the exact size and needs of a facility. Our weapons storage racks allow our clients to use their limited space efficiently while maintaining a high level of security over all firearms, ammunition, and other gear. If you’re ready to upgrade your weapons storage, please contact us to discuss a customized plan.